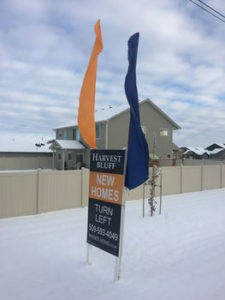 The Harvest Bluff housing development along Betz Road in Cheney has taken on a certain look of hibernation under a blanket of snow. Cheney’s Harvest Bluff housing development has been extremely popular and just recently announced construction of Phase 3. If the Hayden Homes’ project had been a bear this last year it would need and deserve the downtime. Kathy Janus, regional director of the Inland Northwest for Hayden Homes, confirmed that the only current development of new home construction inside the city limits has been a real estate dynamo. “If I look at data January (2016) through October, there were 173 closings in Cheney,” Janus said. Of that number only 36 were for new homes, and 31 were Hayden projects. Those closing numbers, however, are from the area that includes the city, and other portions of the 99004 zip code. “If you look at Cheney proper, the city itself, we had 100 percent of the new homes building there,” Janus said. The median pricing for homes in Cheney is $200,000 with a Harvest Bluff property listing at $254,000. There are seven home designs to choose from and base prices in the community range from $199,990 for a 1,408 square-foot, single story, to $274,990 for a 3,195 square-foot two story on what plans ultimately call for 136 homes on 32 acres bordered by Murphy Road to the east. Harvest Bluff has filled a niche in Cheney and the proof is in how fast the project has moved along since the development first gained approval in 2008. Phases 1 and 2 each consisted of 24 homes. The closings in 2016 are from both phases of construction. “There isn’t a lot of new home building, new construction, “Janus said. Phase 3 has just been put up for sale, Janus said. Permit applications have been submitted for the first three of a planned 37 homes. One additional phase is anticipated to contain 51 homes, Janus said, adding Harvest Bluff will include a park and walking trail. “We’ll get going on those as soon as possible, again, weather permitting,” she said. Build time with winter weather is about six months she added with closing likely in June 2017. When finished, Harvest Bluff will have five phases. Harvest Bluff was originally a project of Copper Basin Development, a company active in the area of single-family home building in the past decade. They got out of that part of the market to concentrate on their specialty, multi-family. Hayden purchased that portion of Copper Basin’s business, Janus said. Hayden builds in secondary, underserved markets that have a need for new home building, Janus said. “You won’t find Hayden Homes is downtown Portland, in a Portland metro or Seattle metro,” she added. Hayden has been in business 27 years and is the largest builder in the Pacific Northwest, even though they only build in secondary markets. The Spokane area is Hayden’s largest market in terms of the size of the metropolitan area served. “We look for markets that can really use a builder that cares about their buyers and is able to bring a great value to them,” Janus said. Hayden buys home sites that are finished lots and ready to build. Besides Cheney, Hayden has additional area developments in Eagle Ridge, River Run near Spokane Falls Community College, Taylor Cottages off of Park Road, properties in the far East Valley/Liberty Lake area as well as Northern Idaho. “Our Eastern Washington division extends quite a ways, as far west as Moses Lake and as far south as Pullman,” Janus said. (Redmond, Ore.)—In what was part team-building exercise and part philanthropy project, employees of Redmond, Ore.-based Hayden Homes worked together on Veterans Day this past November to build 50 wheelchairs for Northwest veterans facing mobility challenges. Approximately 270 Hayden Homes employees from across the Northwest gathered for the company’s annual meeting on Nov. 11 to participate in the Build-a-Wheelchair® event, a team-building social responsibility program born out of a desire to help American veterans with mobility challenges. Small groups of Hayden Homes team members worked together to assemble, test and decorate the new wheelchairs before engaging in an obstacle course maneuverability challenge. After completion, the 50 wheelchairs were distributed to five Northwest regions in which Hayden Homes does business, including the Willamette Valley, Central Oregon, the Tri-Cities/Walla Walla area in Washington, the Spokane and Coeur d’Alene areas in Washington and North Idaho, and the Treasure Valley in southwestern Idaho. Hayden Homes then partnered with local veterans outreach and advocacy groups in each region to identify 10 veterans in need. According to Disabled American Veterans, the number of veterans with service-related injuries and illnesses has skyrocketed to more than 3.6 million men and women today, up from 2 million just 12 years ago. By the year 2020, the number is expected to grow to 4 million. Build-a-Wheelchair® is an original program from Best Corporate Events, the country’s largest corporate team-building company. Hayden Homes, the largest privately held homebuilder in the Northwest, has been building high-quality value-driven homes throughout the Northwest for nearly 30 years. The organization supports local communities by employing local contractors and vendors and contributing annually to philanthropic efforts in the communities in which they build. Since 1989, Hayden Homes contributed more than $9 million to charitable donations with the flagship of their giving through the 501C3 Non-Profit, First Story (www.firststory.com). The Hayden Homes brand family of companies – Simplicity by Hayden Homes (www.simplicity-homes.com), Wise Size Homes (www.wisesizehomes.com) and Hayden Homes (www.hayden-homes.com) – have built in over 200 communities and in over 50 cities and towns throughout Washington, Oregon and Idaho.